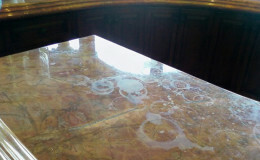 Etching is damage that occurs on floors, countertops, vanities and other natural stone surfaces when an acidic substance, such as lemon juice or cleaning products, comes into contact with calcite or other minerals in the stone that are sensitive to acid. An etch is often mistaken for a stain or watermark because of the dull whitish mark that is left behind, but etching is actually a chemical reaction that roughens the surface of your stone. Very mild etching can sometimes be removed with a polishing powder. 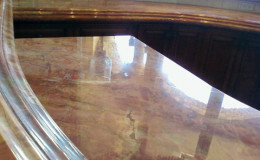 Deep etch removal, however, should only be accomplished by a professionally trained and certified stone restoration contractor. Either way, it would be best to contact us, because the last thing you want is to cause additional damage to your natural stone. Hi-Tech Cleaning Services specializes in etch removal, providing the same dramatic results you see in these images. 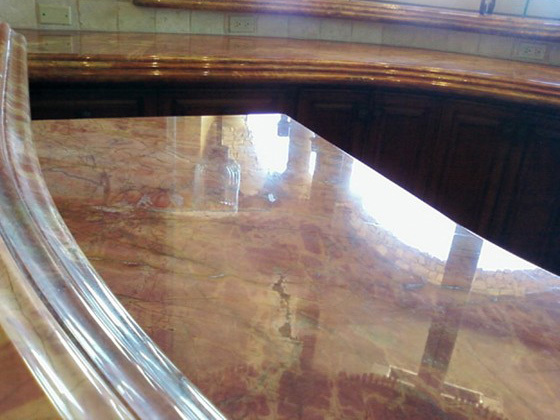 Whether your natural stone is in your kitchen, bathroom, or another area of your home or business, we can expertly remove etch marks, leaving your stone as beautiful as the day it was installed. 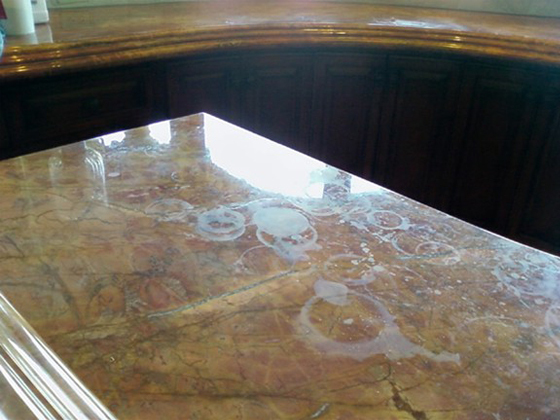 Call (914) 423-4600 or contact us online to learn more about our fine surface care, including marble etch removal and specialty cleaning in Yonkers and the greater New York City area.